Riegl USA is proud to announce SarPoint Engineering as the first industry leader to take delivery of the RIEGL VMX-450 Mobile Scanning System. SarPoint Engineering will utilize the RIEGL VMX-450 with the CS6 Camera System to collect detailed information specializing in a wide range of applications including as-builts, surveying, architecture and cultural heritage, topography and mining, monitoring and civil engineering, and transportation. “We are excited about being the first in both Canada and the world to own the first RIEGL VMX-450 Mobile Laser Scanning System,” said Chris Tucker, P. Eng., SarPoint’s President. “We are positioning ourselves for the future.” “We are also excited to have the opportunity to partner in research with the University of Calgary; Department of Geomatics who is the leader in Geomatic Research inWestern Canada,” said Dr. Robert Radovanovic, P. Eng., SarPoint’s Chief Executive Office. 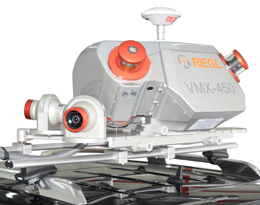 The RIEGL VMX-450 mobile scanning system consists of two RIEGL VQ-450 scanners on a mounted platform accompanied by a GPS-INS and up to 6 digital cameras or video equipment. Accommodating multiple cameras ensure a 360 degree field of view. Most standard station wagons or off-road vehicles can be utilized for easy installation and the scanners are powered directly from the car’s battery. Data acquisition is operator controlled using a touch screen and a wireless keyboard. The system was designed with the user in mind– set up is fast, easy and safe! At 1,100,000 measurements per second, the RIEGL VMX-450 mobile scanning system allows surveyors to capture highly accurate and high resolution dynamic 3D data at highway speeds. The ability to travel at high speeds significantly increases safety for all applications, including mapping of highways, railroads and waterways as well as extended urban area, construction sites and open pit mines. The speed also contributes to a significant reduction in project time. The cutting edge echo digitization technology used in the RIEGL VMX-450 mobile LiDAR scanning system penetrates foliage, fences and other obstacles. The system’s online waveform technology allows for more than 10 measurements per laser shot. The combination of these technologies results in laser precision of 5mm or better and engineering grade accuracy. The new high performance fully calibrated VMX-450-CS6 Camera System completes the RIEGL VMX-450 Mobile Laser Scanning System by supporting six digital color cameras. The new system is extremely compact and user-friendly. As seen below, the VMX-450-CS6 is positioned on a lightweight aluminum frame for versatility and stability. RIEGL’s RiACQUIRE Software manages acquisition of precisely time stamped images by the VMX-250-CS6 in addition to the acquisition of the VMX-450 laser scanner data. In addition, the software controls the camera’s parameters and enables image monitoring during acquisition in real time. The sealed camera housing can be used under demanding environmental conditions. The key factor to Riegl USA’s reliability and success is the full service experience offered to our customers, from your initial purchase, integration of the system, training and support. RieglUSA stands out as an industry leader. Riegl USA located in Orlando, FL, is the North American office for RIEGL Laser Measurement Systems, GmbH, with headquarters in Horn, Austria. With over 33 years experience in the research, development and manufacturer of time-of-flight based optical radar systems, our products are used for tripod, airborne survey, industrial process control, altimetry, aerospace, mobile, hydrographic and bathymetric applications. SarPoint’s strong background in surveying, engineering and environmental science, coupled with our superior team of technicians, engineers and agrologists, helps ensure that we meet our clients’ needs. But our relationships with our clients are built on more than our knowledge and expertise – we build collaborative partnerships with every participant on a project, working together to find solutions to your specific challenges. Our personnel work at the project site, allowing us to provide you with the most knowledgeable advice and efficient service in the industry, while upholding strict safety standards. Working so closely with our clients ensures open communication, which in turn allows us to better understand your challenges, present solutions, and deliver the results you expect.